Stadium table gaming is all the rage at Pennsylvania casinos. The relatively new format, which combines the feel of a slot machine with the presence of a live dealer, has gained traction at the state’s biggest casinos, particularly Sands Bethlehem, which recently expanded its offering and currently supports seating for nearly 200 players. And now, it appears as though the state’s third highest grossing casino, Rivers Casino, is readying to jump on the bandwagon. What is stadium or “social” table gaming? While Rivers isn’t calling its soon to be debuted format stadium gaming — instead highlighting its more social aspects — Rush Table Zone shares nearly all characteristics of live table gaming arenas featured predominantly on several PA casino floors. How it works is relatively simple. Players are seated at one of multiple terminals, where they insert money or casino slips to enable play, just as they would at any slot machine or fully electronic table gaming terminal. The main difference being that they will have the option to play their favorite table games against real live dealers, who use physical playing devices to determine the outcomes of blackjack, roulette, and baccarat games. Payouts are handled digitally, and player decisions have no impact on others players’ outcomes. The format is suspected to be targeted at both millennials and slot players wanting to make the transition to lower house edge games, but who still want to dodge the nerve-wracking aspects of playing traditional table games. Budget conscious players may also take to the format, as the minimum wager is typically much lower than it is on the green felt. And there’s even something for action junkies, as some stadium gaming terminals allow players to wager on multiple games at once. Mohegan Sun at Pocono Downs emphasizes this aspect of its Fusion Hybrid multi-game experience. It’s difficult to say whether or not stadium table gaming will be a boon for Pennsylvania’s land-based casinos, although so far the results appear encouraging. Sands, which debuted a 150-seat table gaming arena in July 2016, and later added 44 $5 minimum blackjack terminals in August 2017, has seen its table games revenue rise 4.36% in the first half of 2017 versus H1 2016. Parx too has seen an uptick, with table games revenue climbing an impressive 28.2% from September 2015 to September 2017. For Sands, which hasn’t added many new green felts in the past two years, the modest rise in revenue does appear to be related to the proliferation of stadium gaming, although it could also be a byproduct of increased emphasis on its world renowned baccarat pit. At Parx, the live action table gaming rollout was more graduated and modest, suggesting that other factors played a role in the massive rise in table game revenue. Rivers has seen its table games revenue dip 5.8% over the first nine months of 2017, hinting that players crave new innovations. 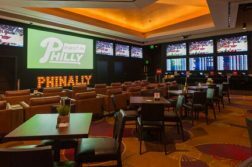 From this, we gather that the impact of stadium style table gaming has been a net positive for Pennsylvania casinos, but just how much of a positive remains an open question. If there’s one thing that’s clear, it’s that Pennsylvania casino operators are actively seeking out ways to draw players to their table games. Since debuting table games, there hasn’t been a single year where table gaming revenue accounted for a small percentage of total gaming revenue than the year before. 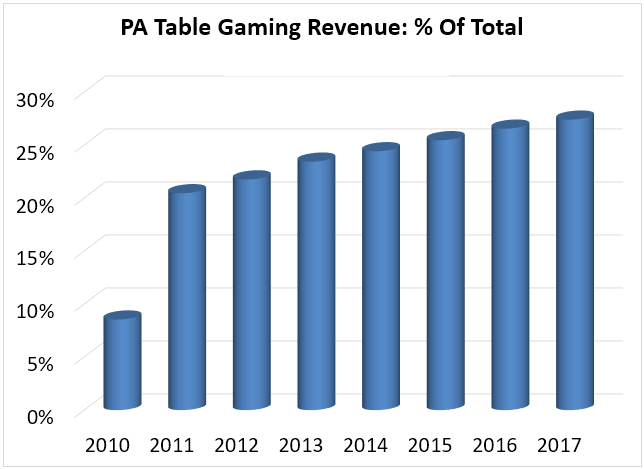 Given this trajectory, it won’t be more than a few years until table games account for more than 30% of gross gaming revenue in the Keystone State, a staggering percentage considering the first table games were only installed this decade. There are several plausible reasons why table games are taking over, one being that technology now allows for one dealer to service dozens, or even hundreds of players. Also, slot players may be growing disgruntled with the bottom-barrel returns on the state’s slot machines, which hover in the 88 – 89% range. This would certainly explain why slot revenue has stagnated of late, showing year-on-year declines in 12 of the past 13 months. Lower staffing costs are also a consideration, as stadium gaming in particular keeps overhead low. But the most compelling argument is that the movement toward table games is by design. The Pennsylvania market is unique in that it’s subject to a reasonable 16% tax rate on table games and an otherworldly 54% rate on slots. It’s therefore little wonder why operators would want to place a stronger emphasis on games where it gets to keep the lion’s share of the profits. Will a similar strategy emerge online? 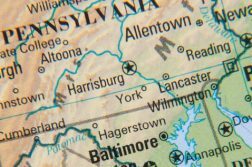 Pennsylvania recently legalized online gambling, and online casinos will be subject to the same tax rate split as brick and mortar operators. Only for online operators, they do not have high margin, non-gaming options (hotel, food and beverage, entertainment) to fall back on, so finding a way to maximize gaming earnings is even more critical. Given this, it wouldn’t surprise if the spread of stadium style table gaming signals an even more aggressive table gaming strategy from online operators. The most parallel format online is Live Dealer, which is only featured at two NJ online casinos, but is bound to be more attractive in the PA market. 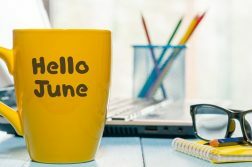 We also could see more marketing dollars spent on table games, and a greater number of high house edge table gaming side bets. Progressive side bets are also a possibility. In short, Pennsylvania seems ready and willing to push its table games, a rarity in an industry that where slots are the bread and butter.